Yesterday, former Prime Minister Datuk Seri Najib Razak’s infamous trial resumes. Unlike his first trial, it was reported that there were only about 10 supporters present to greet him outside the court. Nonetheless, the media swarmed in to get a snap of the accused. But, Najib did not address or wave to the public. Previously on Najib’s trial, the first witness Muhamad Akmaludin Abdullah was being crossed examined by the defence team. As a continuation, defence lawyer Harvinderjit Singh requests the witness to produce the three documents related to SRC International, claiming it was necessary to determine its relevance in the trial. Havinderjit then asks multiple questions regarding Companies Commission of Malaysia (SSM) and Akmaludin’s knowledge on its registered companies. The defence contends that alleged discrepancy filed on SRC’s board of directors were untrue regarding the transfer of 999,998 shares from SRC into 1MDB Energy. After dismissing Akmaludin, prosecution sent in their second witness, Azizul Adzani Abdul Ghafar, who is an executive at Bank Negara Malaysia. 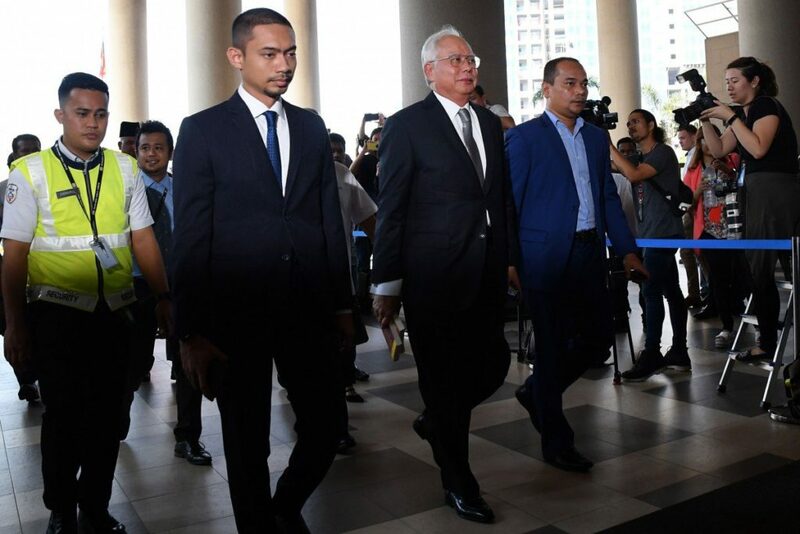 Azizul was part of the raid at Jalan Raja Chulan’s Ambank raid, which recovered four documents accounts related to Najib, three linked to SRC International, and one to Gandingan Mentari. According to his statement when questioned by prosecutor Suhaimi Ibrahim, Azizul was appointed raiding officer by Bank Negara’s investigating officer Farhan Shahrudin, who suspected a breach in the Anti-Money Laundering, Anti-Terrorism Financing and Proceeds of Unlawful Activities Act 2001 (AMLA). After lunch break, proceedings resumed and Suhaimi continued examining the second witness. The hearing was temporarily adjourned by High Court judge Mohd Nazlan Mohd Ghazali when the defence claimed their documents were “jumbled up”. But when the trial to resumed, court-appointed Director of Public Prosecutor V Sithambaram to inform the court that the process of photocopying documents as requested by Najib’s defence team took longer than expected. Therefore, the hearing was adjourned. 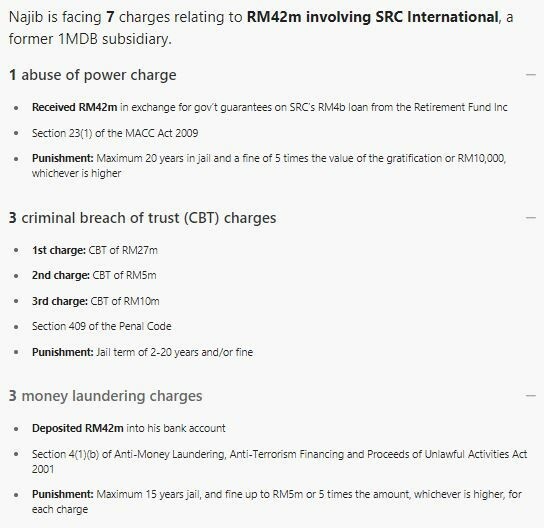 A summary of Najib’s charges can be seen above, sourced from MalaysiaKini. The second day revealed a little more detail on Najib’s movements in SRC International, but nothing overly dramatic happened during the proceedings. The trial resumes today (April 16). Next Is Anwar influential enough to persuade the voters of Rantau?